You can convert video to audio format like MP3, M4A, WAV, MKA, and more. To convert video to audio format, you first need to add downloaded or recorded videos from the "Download" and "Record" tab to the "Convert" tab. Or you can import your local videos to the "Convert" tab. And then move to the next step to start the conversion. In the pop-up output format window, you can click on the “Audio” tab. And then click on “MP3” or other audio format as the output format. 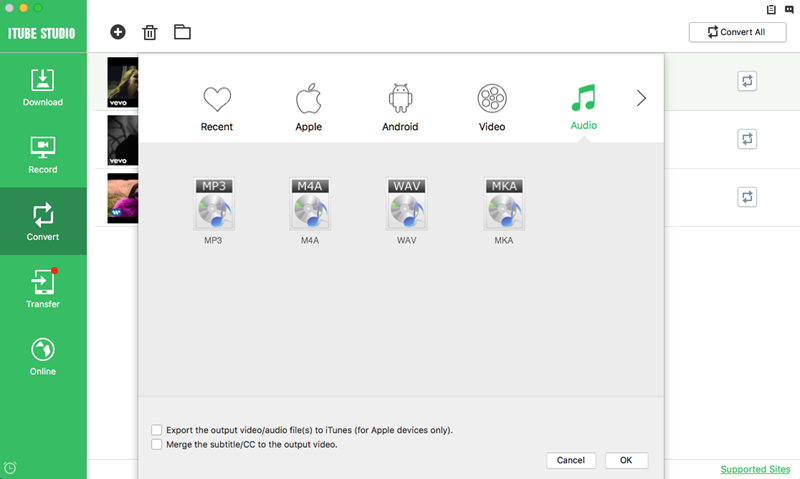 You can also check the option of “Export the output video/audio to iTunes” to directly transfer the audio to iTunes library. And then click the “OK” button to start the conversion. After that, you successfully convert video to audio format, or extract audio from video.